Amid Backlash From Advertisers, Bill O'Reilly Takes A Spring Break : The Two-Way When he announced his vacation Tuesday, O'Reilly carefully noted it had been planned for a while. Still, the trip comes at a conspicuous time for O'Reilly, who is facing sexual harassment allegations. 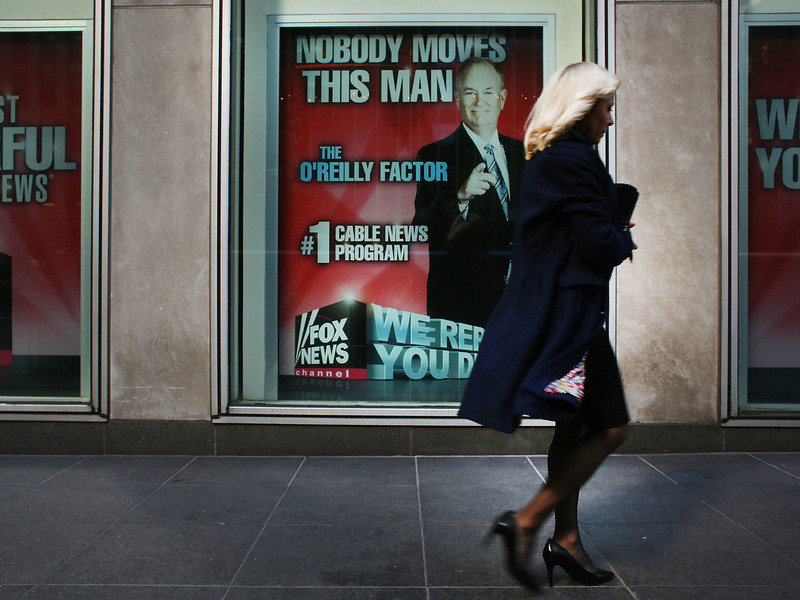 An ad for Bill O'Reilly's top-rated Fox News show stares back at passersby outside the News Corp. headquarters in New York City earlier this month. O'Reilly is stepping away from the show for a vacation as controversy continues to mount around sexual harassment claims. Bill O'Reilly is taking a vacation. The popular Fox News pundit announced his break from broadcasting at the end of The O'Reilly Factor on Tuesday night, pointedly noting that the family trip has long been in the works. "Often around this time of year, I grab some vacation because it's spring and Easter time," O'Reilly told his audience. "Last fall, I booked a trip that should be terrific." What went unsaid in Tuesday's announcement, however, is the rather conspicuous timing of the trip: O'Reilly is stepping away from his show about a week after advertisers began deserting it in droves, following revelations that O'Reilly, Fox News and parent company 21st Century Fox have quietly paid out a total of $13 million in five sexual harassment lawsuits against the star. At last count, dozens of companies have pulled their ads from the program. In other words, according to an analysis by the ad-tracking firm iSpot.tv, The O'Reilly Factor has lost more than half its advertisers since The New York Times first reported the settlements less than two weeks ago. Even as advertisers' support for the show has dwindled, NPR's David Folkenflik reports that discontentment with O'Reilly and the Murdoch family — which owns Fox News — is building among other employees, as well. "There's sort of a contempt for O'Reilly from some of his colleagues, particularly female colleagues," Folkenflik told Morning Edition last week. "And there's a cynicism about the degree of sincerity with which the Murdoch family and the top executives are operating." O'Reilly, for his part, rejects the allegations as unfounded attacks against him because of his wealth and fame, saying he only agreed to the settlements to protect his family. He has also pointed out that no women have filed complaints against him through the company's human resources department, as David reports. Others argue this defense is less than compelling, given the fact that O'Reilly was by no means the only — or the most powerful — figure at the network to be hit with sexual harassment complaints. The company also reached deals to settle a raft of allegations against Roger Ailes. The Fox News chairman was given a massive payout last year to leave the network after those allegations — all of which he has denied. And there are still reverberations from Ailes' time there: For instance, some of the settlements have drawn the scrutiny of federal prosecutors, who are now investigating whether they "were structured to avoid disclosing them to investors in 21st Century Fox," David notes. That said, it's not clear whether advertiser backlash over O'Reilly is particularly hurting his program or network. The Associated Press reports that The O'Reilly Factor, the No. 1 cable TV news show, has in fact gained viewers since news of the sexual harassment charges broke, helping contribute to a record three-month period for the pundit — "his biggest quarter ever in the show's 20-year history." And many advertisers haven't simply withdrawn their ad buys from his show — they've reallocated them to other times of day on the network, diminishing any potential financial fallout for the network. So, while the timing of O'Reilly's departure has ginned up speculation it might be permanent, there is no concrete sign O'Reilly won't be keeping his promise to return on April 24. "We all need R&R," O'Reilly advised his viewers Tuesday. "Put it to good use. Plan it. Don't run into horror on the road. All of us deserve a break, so make sure you take yours." "I'll have a full report when I return."